Remember few days back I did a post on tablescapes with white china. All of you actually left comments saying your white tableware is still resting in the box that it came in. So when I stumbled upon these pictures I had to share this with you, hoping it will inspire the artist in all of us and convince us to air that white tableware NOW! The story is that 1000 kg of porcelain crockery produced by the famous tuscan factory of Richard Ginori (since 1735) were put into the hands of the Italian designer Paola Navone. And this is what she did it with it!! Yes! she painted each piece and created art. And now these renewed "Seconds" are being sold by weight...yes you heard it right by kilos!!! Seriously, how gorgeous are these? 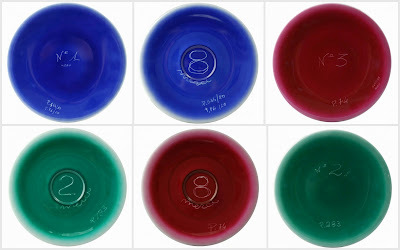 I just love the casually painted look on these platters and of course the bright hues. And just check out the porcelain tablemat. 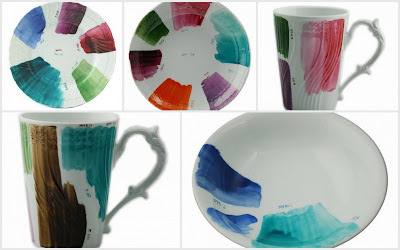 I think I am going to have to buy some white tableware ONLY to paint it like this...hmm..I MUST ;) The ones featured above are my favorite...retaining the white and adding some color, which ones do you like? oh wow!! I thought I had colourful plates till I saw this.. Its impressive.. love the colours.. Would love to try my hand at pottery ... and then painting.. *sigh* some day!! So can one buy these online? Oh My GOD! This is sooooooooooooo pretty. From where do you find these things. Seriously even I want to buy white mats to paint them. This is all so simple and so pretty. I just love it. Patricia : Why not just buy some readymade ones and simply paint them...simpler than learning pottery no? Parul : Unfortunately not...how i wish..sigh! Your blog is so nice that I have actually got adicted to it. I am waiting for you to come back from your holiday and update it soon. In last few days I have read all your old entries. They are all so nice. What I like about your blog is that it is well organized, you can find what you are looking for. It has right combination of text and picture. Person like me who doesn't like reading a lot of stuff will find it interesting. One cannot loose interest. This is like good set of notes which you can refer to whenever you want to do something new. E.g. I can refer to the kids section if I plan to set my baby's room or can look at the food section when I am inviting people over. Hey why don't you add some stuff on home decor. Since I will be moving to my new house it will really help me. could you please send your email ID, and let me know if you would be able to help with deisgning our house in gurgoen.